Morris Wayne McGill was born on January 1, 1930 in Dever-Conner, Oregon to Yancy and Lela (Cox) McGill. Morris was a resident of Stayton for last 64 years and retired from the 701 Operating Engineers and Smoker craft Boats. He married Bonnie Jean McGill in April of 1947 at the Church of God (Seventh Day) and together they had six children. Throughout his entire life, Morris was a true outdoorsman whose best days were spent outside. He loved rock hunting, fishing, gold panning, and hunting. He enjoyed elk, cat and bear hunting and was a member of the Rocky Mountain Elk Foundation and Oregon Hunters Association. He raised and trained his own hounds to take hunting with him and passed on his knowledge of the outdoors to his family, enjoying many hunting trips together. He would also pick huckleberries, mushrooms and wild mountain blackberries. Besides the outdoors he liked collecting coins and going to auctions; he would collect everything and anything. Morris was also a wonderful gardener and would can his own vegetables that he grew. 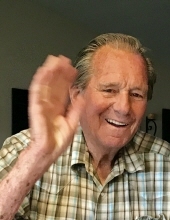 Morris passed away at his home on February 2, 2019 at age 89. He was preceded in death by his wife, Bonnie; children Kay, Keith and Lane; siblings, LaWanda, Ernestine, Betty, Jeanetta, Leola, Stanley, Elizabeth and a grandson, Josh. He is survived by his children, Vickie, Steven and Karen; grandchildren, Clint, Bonnie, Joshua, Brandy, Melissa, Evan, Shawn, Brenna, Terra, Morris, Aaron and Amber; siblings Oleta and David in addition to numerous nieces and nephews. A graveside service will take place Friday February 8 at 1 PM at Willamette Memorial Cemetery in Albany, Oregon with a public reception to follow around 2pm at Church of God (Seventh Day) located at 7478 Stayton Rd SE Turner, Oregon 97392, all are welcome. To send flowers or a remembrance gift to the family of Morris Wayne McGill, please visit our Tribute Store. Please join the family following the graveside service around 2pm for food and fellowship. "Email Address" would like to share the life celebration of Morris Wayne McGill. Click on the "link" to go to share a favorite memory or leave a condolence message for the family.